Mould needs moisture in the form of a water leak, even high relative humidity, together with a nutrient source (soil, wood, paper, organic debris, dust, fabric, drywall, carpeting, etc.) to grow. If you have had a roof leak, basement leak, high humidity, condensation on windows, even an overflowed sink that was not cleaned up properly within 24 hours of its occurrence, you could have mould growth. Mould growth in buildings is not always visible or detectable through a visible inspection. The majority of indoor mould growth issues are hidden inside walls, behind wall paper, underneath flooring or behind built-in cabinetry. Mould does not always produce a musty odor. Mould growth can occur without any scent or visible signs noticeable by the homeowner whatsoever. Toxic Mould Such as Stachybotrys and Memnoniella can cause serious and sometimes fatal health conditions. Indoor mould spores indicate mould growth, which indicates mycotoxin production. Currently, we can measure and identify spores, but it is difficult to measure mycotoxins. Stachybotrys produces at least 170 known mycotoxins. "About 38 percent of homes have mould and fungus growth due to elevated moisture." 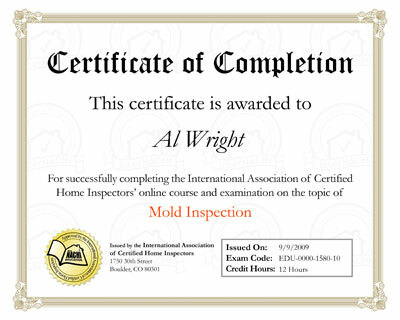 (The American Society of Home Inspectors) Exposure to mould occurs when people inhale mould spores. A 1994 Harvard University School of Public Health study of 10,000 homes in the United States and Canada found half had "conditions of water damage and mould associated with a 50 to 100% increase in respiratory symptoms." According to a recent U.S. General Accounting Office (GAO) report, 20 percent of schools have indoor air quality problems, with many of the schools found in poorer school districts. A 1999 Mayo Clinic Study attributed nearly all the chronic sinus infections afflicting 37 million Americans to moulds. A new medical study attributes nearly 100% of chronic sinus infections to mould. A 300% increase in the asthma rate over the past 20 years has been linked to moulds," as reported in USA WEEKEND, Dec. 3-5, 1999. The Center for Disease Control (CDC) recommends that the humidity levels in homes be kept below 50% to avoid the potential growth of mould. Stachybotrys chartarum is a fungus that has become notorious as a mycotoxin producer that can cause animal and human mycotoxicosis. Indeed, over the past 15 years in North America, evidence has accumulated implicating this fungus as a serious problem in homes and buildings and one of the causes of the "sick building syndrome." Be aware of any noxious odors. When a mould colony is growing, it can give off distinctive odors that are the by-product of its metabolism. What you should NOT do when faced with possible mould growth! Cleaning Mould: Extreme caution should be exercised when attempting to clean up mould. Mould growth from condensation around windows or on bathroom tiles if it is topical in nature and minimal in growth can be cleaned up. Avoid bleaches or chemical biocides since these do not work and cause other environmental problems and health issues. Soapy water with white vinegar, borax and water solution, or a detergent works very well in cleaning up mould. If the mould growth is on drywall, wood beams, carpeting, insulation, etc., you should have it tested to determine the type, quantity and toxic effects of the mould growth. The cause and extent of the mould problem must also be determined prior to any clean up procedure. Proper care must be taken to protect the individual, occupants as well as the remainder of the building when removing mould. Disturbing Mould Growth: Mould growth should be disturbed as little as possible. If mould growth areas are touched, scrubbed, dried out or otherwise disturbed, mould spores may aerosolize and became part of the breathable air. This may cause ingestion and inhalation of potentially toxic mould spores which could lead to a variety of serious health effects. Avoid ripping up carpeting, destruction of drywall or any other destructive activities on building materials showing mould growth until you know what you are dealing with. If wall cavities need to be opened for the purposes of testing, this must be done by a qualified professional with minimal damage to the wall itself. Entry points into a wall should be as small as possible (usually no more than 1/2 inch in diameter). All entry points or punctures in a wall suspected of mould growth must be properly sealed afterwards to avoid mould spores from aerosolizing. Moisture intrusion into a building should be addressed as soon as possible, but so should remediation of the mould growth. If I find mould why don't I just remove it and not bother testing it? In some cases that is sufficient. However, you don't necessarily need to see mould growth in order to have a significant mould problem. Some moulds grow inside the wall cavity without any evidence at all on the visible portion of the wall. In many instances mould may be visible in one room of a building, but the source of the growth is in another room or portion of the building which does not show visible evidence of growth in readily accessible areas. Some of our investigations have resulted in significant mould growth findings where no mould growth was even suspected. I found mould and have reduced the relative humidity to 30% to dry it out. Although high relative humidity can cause mould growth, reducing the relative humidity to very low levels like 30% to dry out the mould is not advisable either. Drying out the mould can increase the chance of it aerosolizing. Mould has a natural defense mechanism where if disturbed, attacked or is dying, it will send out potentially millions of spores into the air that will settle and grow elsewhere. Avoid high relative humidity, but also avoid drying out. A relative humidity of 40% to 50% would be more advisable and have the mould tested and removed. I found mould growing in a corner of my bedroom. I will just replace the drywall. If you have mould growth you need to know why and how much. The source of the mould should be identified in order to avoid the problem repeating itself. If there is a roof leak or other moisture problem it needs to be fixed. A mould test should be performed to determine how bad the mould problem is, what type of mould it is and if it's in any other portion of the building. With this data a proper method of removal can proceed. In some cases a carpenter can replace the drywall. In other cases the unaffected portions of the building, the occupants, and the people doing the mould remediation need to be properly protected. We just bought a house and will be renovating. How can a mould test help? Especially in scenarios where you don't really know the history of the building, it is advisable to test for possible mould amplification before removing walls, carpeting, or doing another structural work. If you start removing drywall and see the back side of it black with mould it is in many cases too late. Sick Building Syndrome or Building Related Illnesses are increasingly the result of either careless building maintenance, careless renovating practices, or toxic mould exposure caused by aerosolized mould spores due to the removal of building materials without proper mechanical safe guards. Exposure to mould can cause reactions depending on overall health, age and the amount of time an exposed person spends in the infected building. Pregnant women, the elderly, infants and young children, people with allergies, chronic respiratory illness and/or chemical sensitivities and those with weakened immune systems are most likely to experience health effects from mould. Sniffer Dog Services, a leading Alberta bed bug and mould canine inspections company, can help you identify the problem with our specialized mould canine inspections services.